"This seemed like such a crazy idea that I began looking into it," Pollan says. "Why should a drug from a mushroom help people deal with their mortality?" Pollan, whose previous books include The Omnivore's Dilemma and In Defense Of Food, started researching different experimental therapeutic uses of psychedelics, and found that the drugs were being used to treat depression, addiction and the fear of death. Then he decided to go one step further: A self-described "reluctant psychonaut," Pollan enlisted guides to help him experiment with LSD, psilocybin and 5-MeO-DMT, a substance in the venom of the Sonoran Desert toad. Each of Pollan's experiences with psychedelics was preceded by worry and self-doubt. But, he says, "I realized later that was my ego trying to convince me not to do this thing that was going to challenge my ego." Pollan's new book, How to Change Your Mind: What the New Science of Psychedelics Teaches Us About Consciousness, Dying, Addiction, Depression, and Transcendence, recounts his experiences with the drugs and also examines the history of psychedelics as well as their possible therapeutic uses. The way [psilocybin is] being used is in a very controlled or guided setting. ... They don't just give you a pill and send you home; you're in a room. You're with two guides, one male, one female. You're lying down on a comfortable couch. You're wearing headphones listening to a really carefully curated playlist of music — instrumental compositions for the most part — and you're wearing eyeshades, all of which is to encourage a very inward journey. Someone is kind of looking out for you, and they prepare you very carefully in advance. They give you a set of "flight instructions," as they call them, which is what to do if you get really scared or you're beginning to have a bad trip. If you see a monster, for example, don't try to run away. Walk right up to it, plant your feet and say, "What do you have to teach me? What are you doing in my mind?" And if you do that, according to the flight instructions, your fear will morph into something much more positive very quickly. The drugs foster new perspectives on old problems. One of the things our mind does is tell stories about ourselves. If you're depressed, you're being told a story perhaps that you're worthless, that no one could possibly love you, you're not worthy of love, that life will not get better. And these stories — which are enforced by our egos really — trap us in these ruminative loops that are very hard to get out of. They're very destructive patterns of thought. This network is downregulated [with psychedelics], it sort of goes offline for a period of time. And that's why you experience this dissolution of self or ego, which can be a terrifying or liberating thing, depending on your mindset. This is what allows people, I think, to have those new perspectives on themselves, to realize that they needn't be trapped in those stories and they might actually be able to write some new stories about themselves. That's what's liberating, I think, about the experience when it works. The experiences that people have are very real to them — they're psychological facts. And one of the really interesting qualities of psychedelic experience is that the insights you have on them have a durability ... This isn't just an opinion, this is revealed truth, so the confidence people have is hard to shake, actually. Smoking is a very hard addiction to break. It's one of the hardest addictions to break. [I wanted to understand] how, after a single psilocybin trip, they could decide "I'm never going to smoke again" based on the perspective they had achieved. And they would say things like, "Well, I had this amazing experience. I died three times. I sprouted wings. I flew through European histories. I beheld all these wonders. I saw my body on a funeral pyre on the Ganges. And I realized, the universe is so amazing and there's so much to do in it that killing myself seemed really stupid." And that was the insight. Yes, killing yourself is really stupid — but it had an authority it had never had. And that, I think, is the gift of these psychedelics. Then I looked out and saw myself spread over the landscape like a coat of paint or butter. I was outside myself, beside myself, literally, and the consciousness that beheld this ... was not my normal consciousness, it was completely unperturbed. It was dispassionate. It was content, as I watched myself dissolve over the landscape. What I brought back from that experience was that I'm not identical to my ego, that there is another ground on which to plant our feet and that our ego is kind of this character that is chattering neurotically in our minds. And it's good for lots of things. I mean, the ego got the book written, but it also can be very harsh, and it's liberating to have some distance on it. And that was a great gift, I think. Sam Briger and Seth Kelley produced and edited this interview for broadcast. Bridget Bentz, Molly Seavy-Nesper and Scott Hensley adapted it for the Web. This is FRESH AIR. I'm Terry Gross. 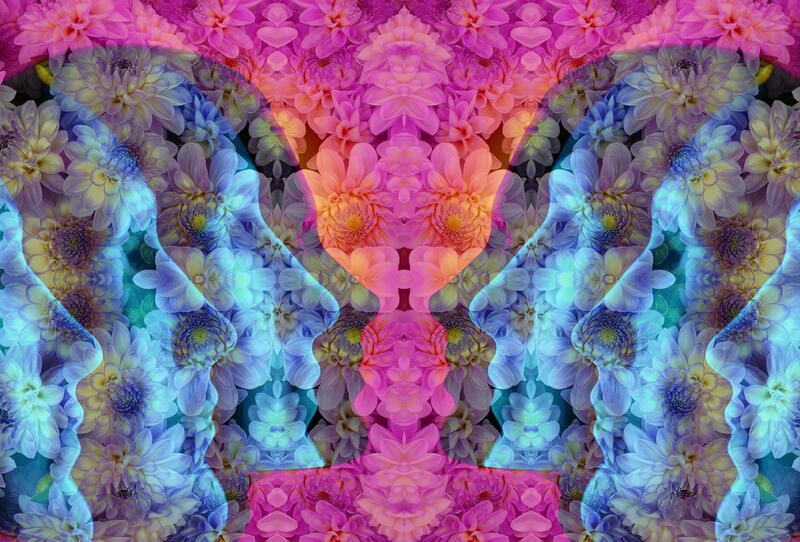 Psychedelic drugs are having a surprising renaissance, being used experimentally in therapeutic settings to treat depression, addiction and the fear of death in people with cancer. My guest, Michael Pollan, has written a new book called "How To Change Your Mind: What The New Science Of Psychedelics Teaches Us About Consciousness, Dying, Addiction, Depression, And Transcendence." As part of his research, Pollan experimented with LSD and psilocybin with the help of guides who created the setting and prepared him for the experience. And yes, this is the same Michael Pollan who's best known for his books about food and is the author of the best-sellers "The Omnivore's Dilemma" and "The Botany Of Desire." He teaches writing at Harvard and the University of California, Berkeley. His new book also tells the back story of psilocybin, the active ingredient in magic mushrooms, and LSD, which was created in 1938 by a Swiss chemist working for the pharmaceutical company Sandoz. Because there's so much to talk about, we don't have room for the part of our interview in which we talked about the history of psychedelics, but you'll be able to hear that as an extra on our podcast edition of today's show. MICHAEL POLLAN: Good question (laughing). It is something of a departure for me. I've been writing a lot about food and agriculture. POLLAN: Yeah (laughing). But, you know, it is a departure, but it's also all of a piece. I mean, my interest in food and agriculture really grew out of my interest in nature and how we engage with the natural world. And, you know, we use plants and fungi and other animals to feed ourselves or for beauty, but we also use them to change consciousness. This is an old and I think universal human desire. So I've always had this interest off to the side. In fact, we talked about it a long time ago in - when I wrote "Botany Of Desire," and there is a chapter in there on cannabis. And I've always been curious about psychoactive plants. Then I heard about this new research going on, which I found stunning and implausible. I mean, the idea that you would give a psychedelic - in this case, magic mushrooms or the chemical called psilocybin that's derived from magic mushrooms - to people dying of cancer, people with terminal diagnoses, to help them deal with their - what's called existential distress, and this seemed like such a crazy idea that I began looking into it. Why should a drug from a mushroom help people deal with their mortality? GROSS: So looking at how psychedelics are being used in research today, let's start with depression. How are psychedelics being used to try to treat depression? And we should preface this by saying there's a lot of frustration now about antidepressants. POLLAN: Yeah, and that's part of the story. I didn't realize till I started working on this book how broken mental health care and treatment is in this country and that we really haven't had a big innovation since the late '80s with the introduction of Prozac and then the other antidepressants. And those now are turning out not to be the panacea we thought they were. Their effects are fading. People complain about the side effects, which are really severe. And they're very hard to get off. They are addictive. And they only work a little bit better than placebo in trials, which is kind of remarkable considering how many people are on them. So there is an openness that you might not have seen 20 or 30 years ago to look for new ideas. And one of those ideas was very alive in the '50s and early '60s, and that thread of research was dropped after the moral panic about LSD in the early '70s. Research shut down, but it was actually very promising. There - I didn't realize, but there had been a thousand peer-reviewed studies of psychedelics before the mid-'60s, 40,000 research subjects, six international conferences on LSD conducted by psychiatrists and psychologists. So there's an effort beginning in the '90s - a renaissance, really - to pick up that thread and see how these drugs might help. The way they're being used is in a very kind of controlled or guided setting. When you're being administered a psychedelic - and, by the way, they usually use psilocybin for two reasons. One is, the trip is shorter, so the therapist can get home for dinner. You know, it only lasts, like, five or six hours as opposed to up to 12 hours for LSD. So that's kind of awkward. And also, LSD is just so much more controversial. It has all that political and cultural baggage from the '60s. So psilocybin, which works very similar - works on the same receptors in the brain, has similar effects - is the drug of choice in the therapy. The way it's used is they don't just give you a pill and send you home. You're in a room. You're with two guides - one male, one female. You're lying down on a comfortable couch. You're wearing headphones, listening to a really carefully curated playlist of music - instrumental compositions, for the most part. And you're wearing eyeshades, all of which is to encourage a very inward journey. And you are - someone is kind of looking out for you. And they prepare you very carefully in advance. They give you a set of flight instructions, as they call them, which is what to do if you get really scared or you're beginning to have a bad trip. If you see a monster, for example, don't try to run away. Walk right up to it, plant your feet and say, what do you have to teach me? What are you doing in my mind? And if you do that, according to the flight instructions, your fear will morph into something much more positive very quickly. And in fact, that seems to be the case. And then the session itself, where they do very little - they let your mind and the drug guide your journey, and it takes you on this kind of intrapsychic movie in which if - let's say you're a cancer patient. You confront your cancer or your fear, and you look out and get some ideas about your mortality or your immortality, in some cases. You have what is called a mystical experience. And that is an - yeah, sorry. POLLAN: Yeah. The therapist says very little. It's a very noninterventionist kind of thing because the theory is that you'll go where you need to go; you'll have the kind of trip you need. So for example, if you need to confront your mortality, that's going to happen - and that these therapists believe very much in the power of the mind to heal itself in the same way the body heals itself. So they hang back. If you get into trouble, though they might take - you know, offer a hand or a comforting word, but they try actually to say almost nothing. Because you're so suggestible, if they said something, you would have the kind of experience your therapist wants you to have. So they want to leave it open. And then after the experience, they help you integrate what happened, help you make meaning out of what can be a very confusing and inchoate experience. GROSS: Is one of the premises of this kind of treatment for depression, that when you're depressed, you get caught up in these cycles of thought and these, like, tape loops of telling yourself negative things and seeing the world in negative ways and that through the use of a psychedelic that you're going to almost be forced to perceive things differently, thus opening up the door into a new way of thinking? POLLAN: Exactly right. The drugs foster new perspectives on old problems. You know, one of the things our mind does is tell stories about ourselves. And if you're depressed, you're being told a story, perhaps, that you're worthless, that no one, you know, could possibly love you, you're not worthy of love, that life will not get better. And these stories, which are enforced by our egos, really, trap us in these ruminative loops that are very hard to get out of. They're very destructive patterns of thought. What the drugs appear to do is disable for a period of time the part of the brain where the self talks to itself. And it's called the default mode network. And it's a structure - it's not a structure. It's a group of structures that connect parts of the cortex - the evolutionarily most-recent part of the brain - to deeper levels where emotion and memory reside. And it's a very important hub in the brain, and lots of important things happen there - self-reflection and rumination, time travel - it's where we go to think about the future or the past - and theory of mind, the ability to imagine the mental states of other beings - and I think most importantly, the autobiographical self. It's the part of the brain, it appears, where we incorporate things that happen to us - new information - with a sense of who we are, who we were and who we want to be. And that's where these stories get generated. And these stories can be really destructive. They trap us. And what happens - and this was a big surprise with the modern period of research - that - was that this network is downregulated. It sort of goes offline for a period of time. And that's why you experience this dissolution of self or ego, which is a quite - can be a terrifying or a liberating thing depending on your mindset. And this is what allows people, I think, to have those new perspectives on themselves, to realize that they're - they needn't be trapped in those stories, and they might actually be able to write some new stories about themselves. And that's what's liberating, I think, about the experience when it works. GROSS: ...Successfully in a way that other people could reproduce the same results? POLLAN: Yeah. So there have been - there's a couple research groups around the country. The most prominent are at Johns Hopkins and NYU. Imperial College in London is doing really good work, and so is UCLA - a psychiatrist at UCLA. They have taken this - the therapeutic drug trials of psychedelics through what's called phase two. Drugs basically pass through three phases - a small pilot study to make sure they're safe called phase one. Phase two is a slightly bigger group to see if they're effective. And then phase three is a much larger trial to make sure what you saw in phase two is real. They've just published phase two results that are kind of mind-blowing. They found that - and this was a group of cancer patients, and they were trying to treat their depression and their anxiety. And they found that 80 percent of the people in the trial had statistically significant reductions in standard measures of depression and anxiety. The treatment effect they observed - and this is a measure of how powerful the effect is, how much better than placebo - was three times as high as the one observed when they introduced antidepressants. This is one of the strongest effects of a psychiatric intervention that we have seen. Now, it's important to be cautious about this because it is just a phase two trial. It's only 80 people in two labs. But the results were encouraging enough that the FDA is going to let them go on to phase three, and that's going to start later this year. So we may know a lot more in a couple years whether this is - whether this effect is as powerful as it appears to be right now. POLLAN: That's exactly what I thought. GROSS: ...That's not been happening. yeah. POLLAN: No, people have incredibly positive trips. They have scary episodes. I mean, make no mistake. You know, we have this idea of, there's a bad trip, and there's a good trip. It's usually more complicated than that. A bad trip can be incredibly productive if you face your fears. Just to give you one example, there's a woman I interviewed, a 60ish figure skating instructor who lives in Manhattan, never had touched a psychedelic before. She had ovarian cancer, and she lived in terror of its recurrence. And it - and this paralyzed her. And she entered the trials at NYU. She had an experience with psilocybin that allowed her to enter her body imaginatively, and she saw this black mass under her rib cage, and she realized that was not her cancer. It was her fear. And she beheld this black mass, and she screamed at it. She said, get the [expletive] out of my body. And it vanished. And when she came to, she - her fear had been absolutely extinguished. When I originally wrote about this, I said her fear had been substantially diminished in the usual, you know, journalist-playing-it-safe way. And when the fact-checker called her, she said, no, that's completely wrong; my fear was extinguished. And she said, I learned from that experience on psilocybin that I can't control the cancer, but I can control the fear, and that was - you know, that was an insight that, with the authority of the psychedelic experience, has allowed her to resume her life. GROSS: If you're just joining us, my guest is Michael Pollan. You probably know him from his books about food and plants. His new book is called "How To Change Your Mind: What The New Science Of Psychedelics Teaches Us About Consciousness, Dying, Addiction, Depression, And Transcendence." Back after this break. This is FRESH AIR. GROSS: This is FRESH AIR, and if you're just joining us, my guest is Michael Pollan, who's the author of books like "The Omnivore's Dilemma" and "The Botany Of Desire" - books about food, books about plants. His new book is about psychedelics - their history, their current use in research and also his own experiments with psychedelics. The book is called "How To Change Your Mind: What The New Science Of Psychedelics Teaches Us About Consciousness, Dying, Addiction, Depression, And Transcendence." So we were talking about the use of psychedelics in treating depression and anxiety. There are also research projects now using psychedelics with people who have terminal cancer, and they're in - they're facing their death, and they're very anxious about it. So how are psychedelics being used in that setting? POLLAN: So far, the most exciting trial, I think, has been giving it to people with life-changing diagnoses. They're not all terminal, but many of them are. And I spent a lot of time telling the story of a man named Patrick Mettes, who is a journalist in his 50s who had bile duct cancer that had spread to his lungs. And he entered the program at NYU and had an experience that - you know, it was kind of a review of his life, but it culminated in a vision of an afterlife that he found incredibly compelling. And he had a sense that his consciousness would somehow endure after his death. And he wasn't ready to go there now, but he looked out on what was this very peaceful plane of consciousness and said, OK, that's where I'll go, but I'm not ready yet; I have too much to do in this life, and I don't want to leave my wife Lisa yet. And he - the last 17 or so months of his life were spent without fear. He was able, actually, to make very good use. He stopped his chemo at some point 'cause he wanted - he was very concerned about the quality of the life left to him rather than the quantity, and lived his final months in a state of remarkable equanimity to the extent that when in the last few days of his life when he was in a hospital room at Mount Sinai here in New York, the whole staff of the hospital would gravitate toward his room because of this vibe he was putting out that was so remarkable. And his wife - I never met Patrick. I reconstruct his story from his psychologist's notes, and his own accounts, his diaries and his wife, interviews with his wife, Lisa. But she sent me a picture of him taken three days before his death, and the moment when I clicked that open on my computer, it just took my breath away. I mean, here was this emaciated man in a hospital gown with an oxygen clip in his nose, and he was beaming. It was the most unearthly sight. And that's how he died. And it was this experience - and I say experience, not just drug - that allowed him to die that way. Now, we have so little to offer people in that situation. Prozac doesn't help when you're confronting, you know, your mortality. But here we have something that occasions an experience in people, a mystical experience that somehow makes it easier to let go. And I think some of it has to do with the fact that you do experience the extinction of yourself, and it's kind of a rehearsal for death. And I think that may be part of what helps people, that they expand their sense of what is your self-interest? And your self-interest is something larger than what is contained by your skin. And when you have that recognition, I think dying becomes a little easier. GROSS: What you described that this person experienced on the hallucinogenic sounds like a lot of near-death experiences that other people have described where you see that death isn't going to be terrible, that there's some kind of peaceful beyond that you'll be going to but you still have work to do in this world so that you come back from that near-death experience. And I'm not speaking to the validity of those experiences one way or another. I'm just kind of saying this is what I've read, this is what I've heard that some people have reported. And it's very similar to what you've just said. POLLAN: Yeah. And we don't know what to do with that. There's no way to prove this, obviously. And it was a question that really troubled me as an old-fashioned, materialist, skeptical journalist. It's like, well, what if these drugs are inducing an illusion in people? And I got a variety of answers to that question from the researchers. One was, who cares, if it helps them? And I can see the point of that. The other was, hey, this is beyond my pay grade. None of us know what happens after we die. And others say, well, you know, this is an open frontier, that there may be consciousness that is - you know, we all assume consciousness is generated by our brains. But it's important to understand - I think the Dalai Lama said this - that that's just a hypothesis. There are people who believe that consciousness is a property of the universe, like electromagnetic radiation or gravity. So, you know, we're here at the edge of knowledge, and none of us should be overly confident in what we pronounce. The experiences that people have are very real to them. They're psychological facts. And one of the really interesting qualities about psychedelic experience is that the insights you have on them have a durability. William James called it the noetic sense. This isn't just an opinion. This is a revealed truth. And so the confidence people have is hard to shake, actually. GROSS: My guest is Michael Pollan, who's best known for his writing about food. His new book, about psychedelic drugs, is called "How To Change Your Mind." After a break, we'll talk about how psychedelics are being used experimentally in the treatment of addiction, and we'll hear about Pollan's own experiences with psychedelics. I'm Terry Gross, and this is FRESH AIR. GROSS: This is FRESH AIR. I'm Terry Gross. Let's get back to my interview with Michael Pollan, whose new book is called "How To Change Your Mind: What The New Science Of Psychedelics Teaches Us About Consciousness, Dying, Addiction And Transcendence." The subject is a departure for Pollan, who's best known for his books about food, including the bestseller "The Omnivore's Dilemma." When we left off, we were talking about how psychedelic drugs are being used experimentally in therapeutic settings to help with depression and anxiety and to break out of patterns of self-destructive thinking or behavior. So is that how it's being used in addiction therapy? POLLAN: Yeah. I mean, it's being used in somewhat similar ways in that it's about dope-slapping you out of those stories you tell yourself, like, I can't get through this interview without a cigarette. Or, I can't get through this day without another drink. Those are stories you tell yourself, and that if you can gain some perspective on those stories and realize, no, you're not trapped in those stories, you've had this episode of ego dissolution where you're very plastic again and you can create new stories and new connections in your brains. This seems to allow people to essentially reboot their brains in a way that makes it possible to give up an addiction. Now, this work hasn't gone quite as far. We don't yet have phase two trials on the addiction work, but it is the - it was the primary use of LSD in the 1950s - was to treat alcoholism. And looking back at that research, it was pretty damn successful. GROSS: So as part of the research for your book, "How To Change Your Mind," about psychedelics, you wanted to try them yourself. You were slightly too young for the counterculture era, so you didn't take them in the '60s or '70s. And you wanted to experience them now. You tried to get into some of the studies that are being done, but they don't want, quote, "healthy normals" like you (laughter). GROSS: So you had to go, you know, to the underground. And the first thing that you wanted to do was find a guide because, as they say, set and setting is very important. You have to have a guide and be in good hands and be in a setting where you're not going to freak out (laughter) you know? POLLAN: And you trust the person, yes. I mean, the trust is so important. So I was surprised to learn that there is a thriving underground of psychedelic guides in this country. I don't know how big it is. It's probably in the hundreds. And these are - I mean, these are very professional people. They're often therapists. They're often trained or licensed, and they have found that working with these medicines, as they would call them, is so productive that they're willing to risk their freedom and risk everything to continue to work with them illegally. And so I interviewed a bunch of these people. Now, they're not all people I felt comfortable with. I interviewed a few that I thought were a little too wanky to trust my brain to. And I - so I rejected a few along the way. But eventually, I found a couple that I felt safe and comfortable, that I was willing to have this experience in their presence with their guidance. And, yeah, I would have preferred to done this legally and above ground. There's a lot of anxiety attached to the whole process. And I should say that - well, as you suggested, I was a pretty reluctant psychonaut. I didn't have a lot of experience. I believed all the '60s stories about how LSD would put you in the emergency room or cause you to jump off a building thinking you could fly. GROSS: You only heard the bad stories. You didn't hear the good stories. GROSS: That's very interesting you call them medicines. POLLAN: ...Experience. Well, you know, that's the term that people use underground. I think the word drug has so many - you know, so much moral coloration to it that they prefer the word medicine, and that's how they treat it. That's how they regard it. And then I used another substance called 5-MeO-DMT, which is a pretty obscure psychedelic that is made from the venom - it's the smoked venom of the Sonoran Desert Toad. And that was the kind of craziest thing I did - and then a few ayahuasca experiences. So I was doing what doctors used to do, which is experiment with these drugs on yourself before you give them to anybody else. And the experiences, which every one of which was preceded by a sleepless night of worry, you know, arguing with myself, you know, hey, you're 60 years old. You're going to have a heart attack. You know, you're going to - you could go crazy. There could be some demon lurking in you. I was genuinely afraid. I realized later that was my ego trying to convince me not to do this thing that was going to challenge my ego. And, of course, our egos have command of wonderful rational faculties, and it almost won. GROSS: ...To take a hallucinogenic - yeah. POLLAN: I'm very happy you brought that up. I mean, the fact is, you know, being kind of a scaredy cat about the whole thing, I looked very carefully into the risk profile of these substances. And I was surprised by what I found. Physiologically, they're - you know, they're relatively nontoxic. They're less toxic than alcohol, these drugs, to your body. They're non-addictive. You know, if you give it to a rat and you give them that lever to press, drug or lunch, you know, with cocaine, it will press the lever over and over until it dies. With LSD, it will press it once and never again. So, you know, they're non-addictive. There anti-addictive. But they do carry psychological risks. It's a profound psychological experience. And for people at risk of serious mental health issues, things like psychosis, schizophrenia - not a good idea. For people on other meds like SSRI's - not a good idea. But I had those worries about myself. I mean, we all - well, maybe we don't all. I worried that somewhere, you know, deep underground was a crazy person struggling to get out and I might have opened the door. So I was suitably nervous and therefore very careful. And it's not something to be entered into lightly. Nevertheless, the experiences were some of the most profound of my life. And the idea that a mushroom should have occasioned one of the - I don't know - top five most meaningful experiences I've had in life is kind of remarkable. GROSS: Let's take another break. If you're just joining us, my guest is Michael Pollan. You probably know him from his books about food and plants, but his new book is about the history and the current use of psychedelics. The book is called "How To Change Your Mind: What The New Science Of Psychedelics Teaches Us About Consciousness, Dying, Addiction, Depression, And Transcendence." We'll be right back. This is FRESH AIR. GROSS: This is FRESH AIR. And if you're just joining us, my guest is Michael Pollan, who's the author of books like "The Omnivore's Dilemma" and "The Botany Of Desire." His new book is about psychedelics - their history, their current use in research and his own experiments with psychedelics. And the book is called "How To Change Your Mind: What The New Science Of Psychedelics Teaches Us About Consciousness, Dying, Addiction, Depression, and Transcendence." GROSS: ...That you took? Just tell us first what advice you got beforehand. POLLAN: Well, I worked with a guide that I call Mary in the book who was a incredibly empathetic, compassionate therapist. She was roughly my age. And she prepared me very carefully. I had to fill out lots of medical forms. I had to fill out an autobiographical statement. She wanted to know everything about me. And then, you know, she offered me her own set of flight instructions, you know, which was that if you see something scary, don't run away. So I worked with her, and she - it was a pretty high dose. I was trying to simulate the dose being used in the clinical trials. And so I worked with about 4 grams of mushroom - not the derivative, but the mushroom itself. And I had an experience that was by turns, you know, frightening and ecstatic and weird. Initially, I found myself in this weird computer-generated world. It looked like the - you know, that foam that you see in a recording studio full of stalactites or stalagmites? It was a world made out of that stuff for some reason. And I didn't like it. It was a product of the music I was listening to. And one of the really interesting things about psychedelics is something called synesthesia - that your senses get cross-wired, so that the sounds you hear start generating palpable space. GROSS: How'd it turn? Yeah. POLLAN: Well, I wasn't - it turned about now. After the booster shot, I found myself in this place where I could no longer control my perceptions at all. And I felt my sense of self scattered to the wind, almost as if a pile of Post-its had been released to the wind, but I was fine with it. I didn't feel any desire to pile the papers back together in terms of my - you know, into my customary self. And then I looked out. And I know how paradoxical this sounds. I looked out and saw myself spread over the landscape like a coat of paint or butter. I was outside myself. And the consciousness that beheld this, though, was not my normal consciousness. It was completely unperturbed. It was dispassionate. It was content as I watched myself dissolve over the landscape. And what I brought back from that experience was that I'm not identical to my ego, that there is another ground on which to plant our feet and that our ego is kind of this character that, you know, is chattering neurotically in our minds. And it's good for lots of things, right? I mean, the ego got the book written. But it's also - can be very harsh, and it's liberating to have some distance on it. POLLAN: I know I'm babbling now (laughter). GROSS: ...To anyone who hasn't experienced something similar. GROSS: And that's, I think, part of the problem that people run into in trying to explain the transcendence of the experience that they had. GROSS: Well, you have described yourself as somebody who didn't think of yourself as having a mystical bent. What did you describe yourself - as a something materialist? GROSS: So how long as this lasted? I mean, you've had - you had this - these experiences - I don't know when your last trip was, but do you still feel transformed in some way by it, or does that seem more like a memory of how something once was different but no longer is for you? GROSS: Oh, I'm sorry. Yeah. GROSS: I didn't turn to hallucinogenics as a result. But no, I felt with both of my parents that it was something they didn't really want to talk about. POLLAN: And maybe that's generational. It's obviously not easy to talk about. But here, with these people who'd gone through this experience - and of course, these are people who sought this experience, so they're a special group, perhaps - that I could have that experience and then, indeed, explore it in my trips. But when I asked my wife this question of - do you think I'm any different? - she said something interesting, which is, well, I don't think you would've dealt with your dad's death quite the way you did. POLLAN: More meaningful, yes. And more emotionally available. Less defensive. And I think that's the big gift of these experiences when they go well, which is that, you know, the defenses that we have - and they're very important. They help protect us. They also wall us off. They wall us off from other people. They wall us off from nature. And to reduce their influence in our lives, especially at moments of crisis, like a death of a loved one, is an enormous gift. And so I would say she's right that there was a kind of quality of openness that I had that I would not, that I did not have before. And, indeed, measuring openness is something they've done. And in one very intriguing study, they found that people, that that is one of the personality traits. There are five personality traits, according to psychologists. And personality seldom changes once you're past 25. But the personality trait of openness appears to be increased in people who have had a psychedelic experience. So I think that was one of the legacies of my experience. GROSS: If you're just joining us, my guest is Michael Pollan. And you probably know him from his books about food, but his new book is about the history and the current use of psychedelics. The book is called "How To Change Your Mind: What The New Science Of Psychedelics Teaches Us About Consciousness, Dying, Addiction, Depression, And Transcendence." We'll be right back. This is FRESH AIR. GROSS: This is FRESH AIR. And if you're just joining us, my guest is Michael Pollan. You probably know him from his books about food, like "The Omnivore's Dilemma," and "The Botany Of Desire," which is also about how plants can influence the mind. And his new book takes that a step further. It's a history of psychedelic drugs, including how they're being used today in research settings. And the book is called, "How To Change Your Mind: What The New Science Of Psychedelics Teaches Us About Consciousness, Dying, Addiction, Depression, And Transcendence." GROSS: Seriously. 'Cause you've written about eating plants, you've written about eating animals. Are you eating any differently than you were before using psychedelics? Because you also talk about feeling that the plants in your garden have a spirit. I don't know how that translates to eating them. POLLAN: (Laughter). Well, one of the really interesting things that happens to some people on psychedelics is that their sense of nature changes. And nature becomes more alive. They're almost animistic. And so I've always had this sense that plants have their own point of view or subjectivity, and that we're not the only perceiving subject on the planet and that's our arrogance to think so. And that was for me an intellectual conceit, but it became real on this psilocybin trip I had, a different psilocybin trip, where I was outdoors for most of it. And I had a sense of that there were spirits in all the plants, and that they were looking back at me in some sense. POLLAN: Almost. I'm a kind of a very reluctant carnivore. I eat very limited kind of meat from farmers that I know, and, you know, pastured eggs and all that kind of stuff. I mean, I'm very careful about what I eat, but that doesn't owe to my psychedelic experience. That owes to having been on feed lots and seen the horrors of industrial animal agriculture and not wanting to be part of it. But I think that, you know, had I not done that work before this, it might have made me think about it. I did tend to focus more on plants than animals during these trips, and maybe that's just my orientation. But my respect for them, my sense of their agency, was definitely increased. And this, too, is something that has been measured by the researchers. There's something called nature relatedness that they can measure, and it goes up after these experiences. GROSS: OK. So one of the phrases you're famous for, and this is from "The Omnivore's Dilemma," is, eat food, not much, mostly plants. GROSS: So that's become pretty famous. Is it still as meaningful to you and what's it been like for you to see that phrase have a life? POLLAN: You know, it is still meaningful. There's nothing I would change. I think it still is a good guidance for eating. It's interesting to see it enter the culture. I mean, you know, I've seen online people saying, you know, his new slogan should be do drugs, mostly psychedelic, not too much. POLLAN: And I don't want to be associated with that line. But it's remarkable when you create a meme that enters the culture that way. You know, I hope I can come up with something just as good because I'm not sure I want that on my gravestone. POLLAN: Well, here's what I support. I support doing this research and seeing it through to the end and supporting it so that we can first confirm that these are as valuable a therapeutic tool as they appear to be. And then I support giving doctors the ability to prescribe them. I think it would be a shame, though, if that were the only thing we ended up with. There is something called, as one researcher memorably put it to me, the betterment of well people that we need to think about because as important as these medicines could be for people struggling with their mortality or depression or addiction, whatever it is, the rest of us have problems, too. We're all mired to some extent or other in repetitive loops of thought and destructive patterns of behavior and thinking and that these drugs may offer us something, too. So the challenge then becomes how do you make it available to those people? I think it needs to be very carefully regulated. I think that perhaps, you know, maybe you only take them with trained - people who have gone through a course and have had training. But I think we need to - if we only medicalize them, we'll be missing out on something that could help a lot of people who are suffering in different ways or to different degrees. I don't know exactly how to devise that regime. And I think it's an enormous challenge to the culture. But imagine if we had mental health clubs where you could go once a year, let's say on your birthday, and have a guided psychedelic experience as a way of taking stock on where you are in life. I think that could be a kind of nice idea. GROSS: So you know the Bach "Cello Suite" that you listened to on one of your psilocybin trips and that so profoundly moved you, do you listen back to that now? And what does it do for you when you listen to it without the psilocybin? POLLAN: Yeah. It's a very meaningful piece to me now. I listen to it a lot, actually, often when I'm writing. And I listened to it when I was writing the book. One of the things that psychedelics seems to do, and there's been research to prove this, is attach a sense of significance to the music you hear when you're on the trip. And so all the pieces I heard, even the crappy ones, mean more than they did. It's sort of like, you know, there's this research that music you hear when you're 17 to 21 will always be very meaningful to you. There's something about that age where you attach meaning to it. Well, that happens again with a psychedelic. GROSS: So Michael Pollan, thank you for your book. Thank you for your history of the research into psychedelics and for your own (laughter) experiments into psychedelics. It's all really fascinating. I wish we had time to talk more. POLLAN: Thank you, Terry. We didn't get to talk about your experiences. GROSS: Michael Pollan's new book about psychedelic drugs is called "How To Change Your Mind." There was no time in the broadcast for the part of our discussion about the history of psychedelics, including a section about how Bill Wilson, the co-founder of Alcoholics Anonymous, credited his sobriety, in part, to a mystical experience he had on belladonna, a plant-derived hallucinogenic. You can hear all that as an extra in the podcast edition of today's show. GROSS: She has a new Netflix comedy special. A lot has changed in her life since we last spoke following the comedy set in which she revealed to the audience she had cancer. She's recovered, she's married to actress Stephanie Allynne and they have twins. I hope you'll join us. We'll close today's show with Yo-Yo Ma performing the Bach "Cello Suite In D Minor," the piece Pollan listened to during one of his trips. GROSS: FRESH AIR's executive producer is Danny Miller. Our interviews and reviews are produced and edited by Amy Salit, Phyllis Myers, Sam Briger, Lauren Krenzel, Heidi Saman, Mooj Zadie, Thea Chaloner and Seth Kelley. Therese Madden directed today's show. I'm Terry Gross. Transcript provided by NPR, Copyright NPR.